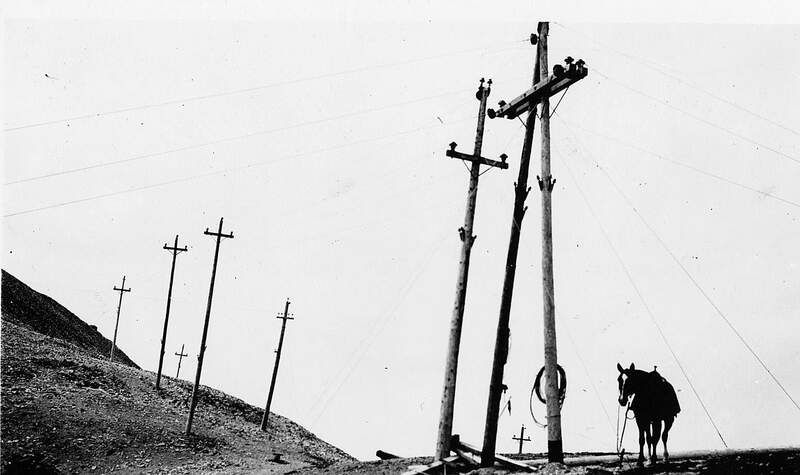 In 1905, these power lines at 13,200 feet ran between Savage Basin and Camp Bird Mine near Telluride. The photographer is not known. Three workers in 1910 inspect the Lake Hope tunnel before the release of water from Lake Hope to the Ames Power Plant near Telluride. The photographer is unknown. 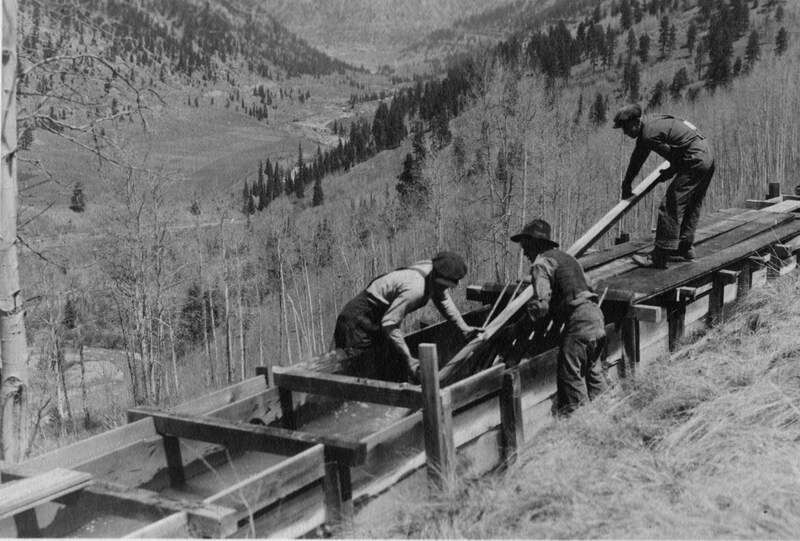 Workers build the Ilium water flume near Telluride in 1923. The photographer is unknown. 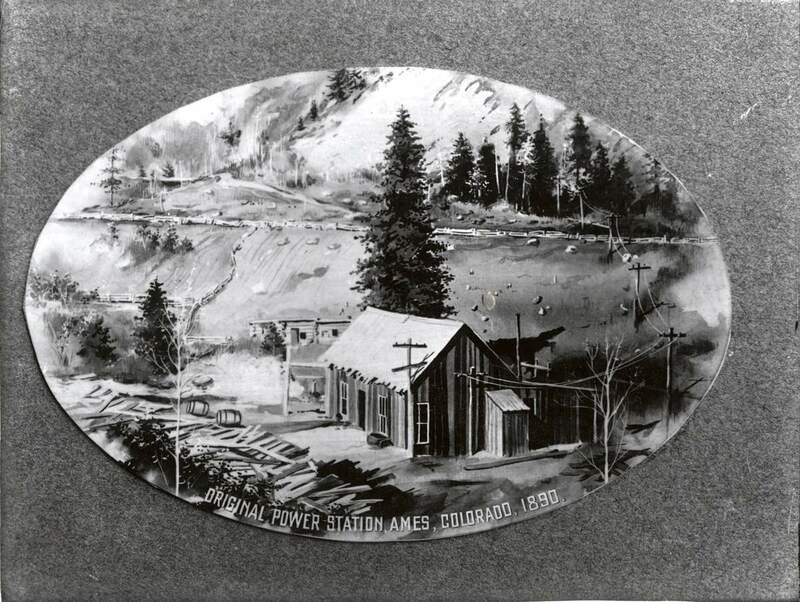 A drawing of the world’s first hydroelectric plant to use alternating current in Ames, outside Telluride. The plant powered the Gold King Mine. 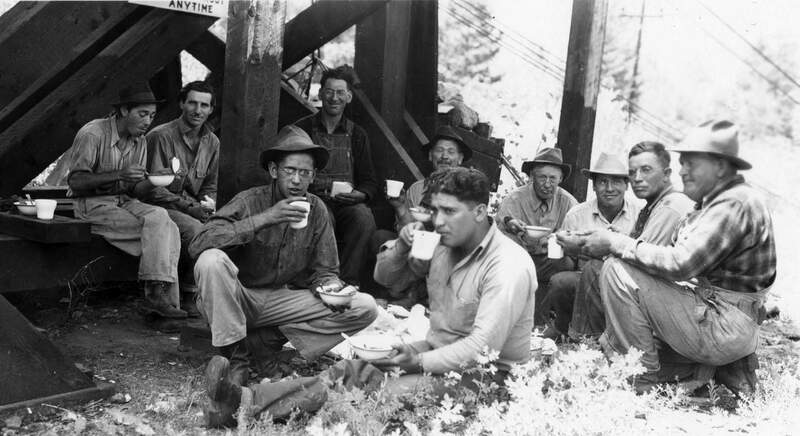 Bob Yeager’s “bull gang” takes a lunch break at Tacoma in June 1945 in this photograph by P. C. Schools. P.C. Schools, chief electrical engineer for the Western Colorado Power Company, photographed this motor-operated needle drive at Tacoma in 1937. Hoadley Maris, survey crew chairman, is photographed in Silverton in 1929. The photographer is unknown. Tough Men in Hard Places: A Photographic Collection. The photograph by P.C. Schools shows an unidentified man inspecting wear and tear on Trout Lake water flume near Telluride. A line of wooden power poles poke defiantly, if not precariously, from a rugged, high-altitude landscape. Two men, cradled by the wooden flume they’re building, stop to smoke cigars. And inside newly built power plants at Ames and Tacoma the elegant machinery of electrical innovation signals a new era. 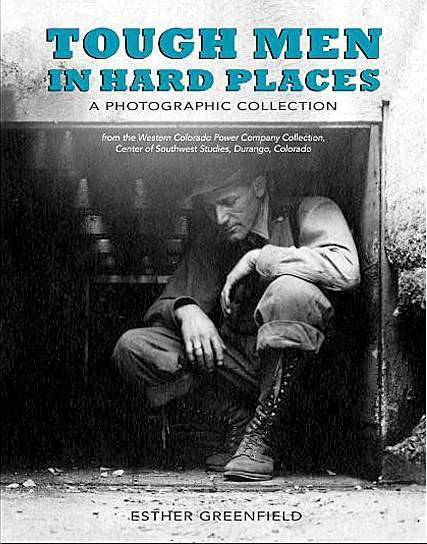 In her visual history Tough Men in Hard Places: A Photographic Collection, Esther Greenfield uses these images and nearly 80 more to tell the story of the visionary, backbreaking and sometimes deadly work of bringing electricity to Southwest Colorado. Electrification came on the heels of the mining boom, but it was electricity that saved the mines and eventually transformed the lives of business owners, homemakers and schoolchildren. In 1891, the Ames Power Plant near Telluride became the world’s first to successfully produce and transmit alternating current. The lines that carried the electricity to the Gold King Mine opened a new age for the commercial application of power. For the next two decades, power companies sprang up, merged, failed and eventually consolidated into the Western Colorado Power Company. 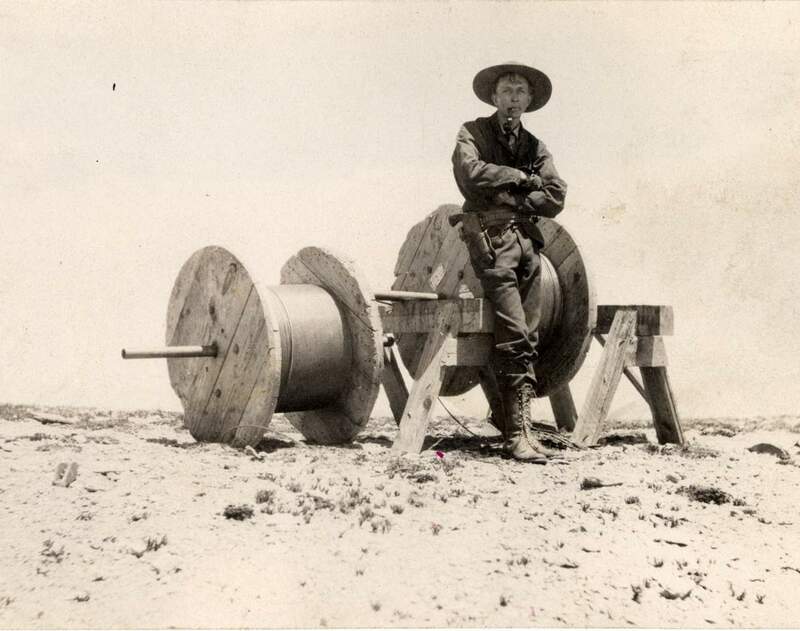 The images in Tough Men in Hard Places come from the power company’s collection of 8,000 documents, blueprints and photographs, most taken from the 1890s to the 1940s. The collection was donated to the Center of Southwest Studies at Fort Lewis College, where Greenfield, a volunteer, got the first look at this treasure trove. She spent three years preparing the collection for an archivist. “Esther’s work was crucial to understanding the photographs,” Jay Harrison, the center’s director, said. The WCPC archive is the center’s only material that covers the electrification of Western Colorado, and Greenfield’s book is a way to bring the center’s publicly accessible and scholarly work to the community, Harrison said. Much of the collection was born at the hands of one man in the early decades of the 20th century. Philip “P.C.” Schools, the chief engineer of the Western Colorado Power Company, seemed to travel everywhere with a camera in tow. His work as a photographic historian and documentarian offers a remarkable account of the growth and spread of electrical technology across Southwest Colorado and the men who made it possible. Greenfield’s 2012 article about Schools, A Powerful Look at Power (which appeared in The Durango Herald), caught the eye of a publisher who called and asked her to produce a book about the era. Seeing the opportunity to publicize the collection, she agreed. For three months, Greenfield pored over the 8,000 images to whittle them to 300. Then, on her dining room table, the book began to take shape. She organized the black-and-white photographs into categories: power poles, people, death and disaster. Some came with good documentation, others with none. Soon the 300 became 150. And later the impossible – selecting 85 for the book. With magnifying glass in hand, Greenfield delighted in peering at subtle details such as two men perched atop smokestacks more than 100 feet above the Durango powerhouse in 1917 and a dog wearing shoes at the Tacoma power plant in 1910. But most of all she was drawn to the rugged men and the aesthetics of the machinery – the architecture, large and small, of a new age. More than 10 men straining to raise a power pole near the Tacoma power plant in August 1930. A team of workers cutting through solid rock at Tacoma in 1928. Residents of Telluride, at a familiar intersection, gathering around a Christmas tree with electric lights in 1916. 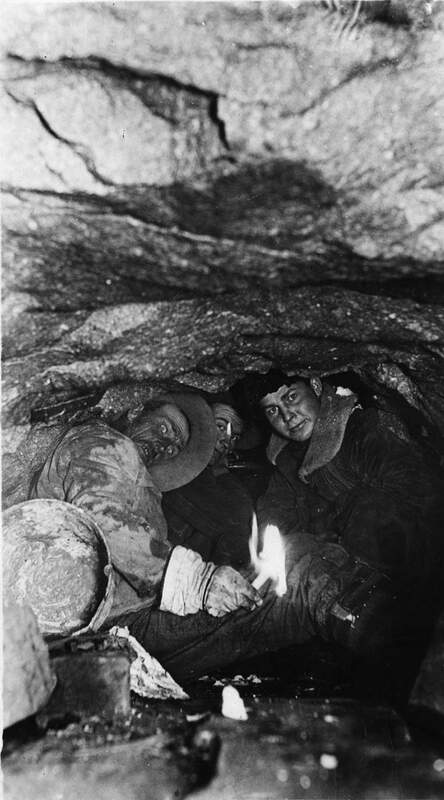 Three men, faces stained with dirt, staring back at you from the depths of the Lake Hope Tunnel near Telluride in 1910. A 1,200 horsepower waterwheel in Ames, 1923, bearing menacing metal teeth. The sublime, modern arcs of the generators at Ames and Tacoma. A sturdy silhouette swinging a sledgehammer at the Cascade Dam in 1909. The text is spare, but equally as evocative as the photographs, especially quotes from the workers. Technological progress came with a price. Workers were electrocuted, buried in snowslides and even carried away and drowned in flumes. 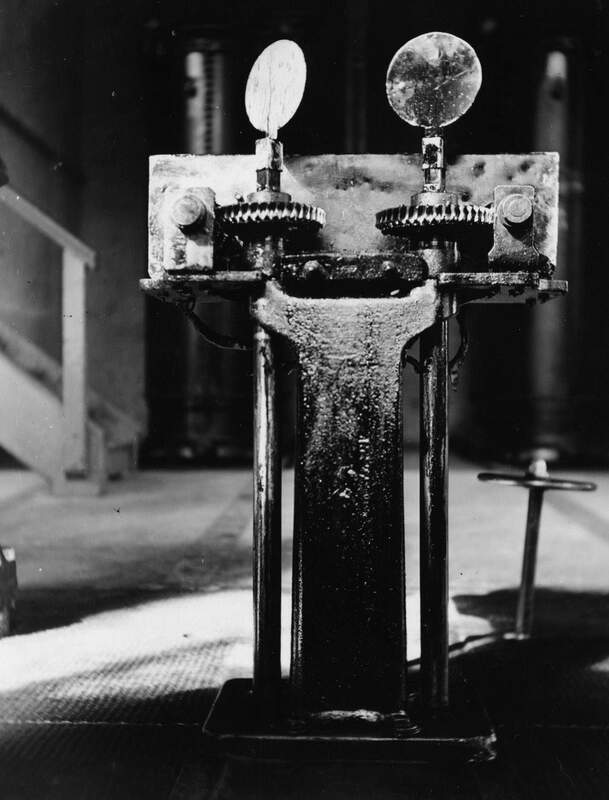 “These were some of the most intense industrial applications of electricity at the time,” Harrison said. Two upcoming events will feature Greenfield and Tough Men and explore the origins and evolution of electricity in Southwest Colorado. The Center of Southwest Studies will host a book launch and signing Thursday with prints from the WCPC collection on display. At the Powerhouse Science Center on Oct. 26, Greenfield will discuss her book, La Plata Electric Association will talk about electrical equipment used today and the powerhouse will give a tour of its historic machinery. “The event is for anybody interested in getting a full picture of the electricity industry,” said Danielle Ghear, aka “Biodiesel Dagger,” a visitors services coordinator at the powerhouse. 4 p.m. Thursday, Delaney Library, book launch and signing of Tough Men in Hard Places: A Photographic Collection with author Esther Greenfield. Prints from the Western Colorado Power Company collection will be on display. 4-6 p.m. Oct. 26, book signing, presentation, tour at the center, 1333 Camino del Rio. 4 p.m. La Plata Electric Association will discuss equipment and how linemen work today. 4:30 p.m. Tour of original Durango Light and Power Company machinery and equipment. 5 p.m. Presentation by Esther Greenfield, author of Tough Men in Hard Places: A Photographic Collection. 5:30 p.m. A panel, including Greenfield, historians and electricity experts, will answer questions. This event is designed for adults and older children.